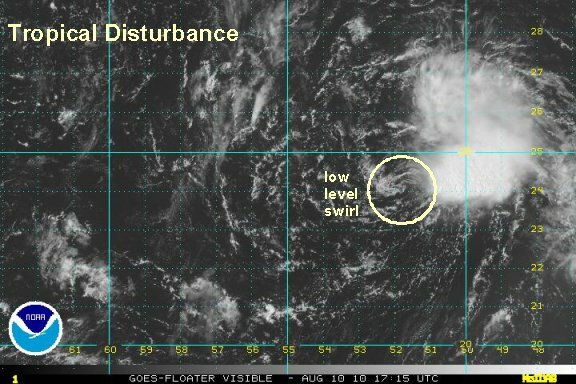 A tropical disturbance over 1000 miles east northeast of the Leeward islands has a well defined low level spirl with it. 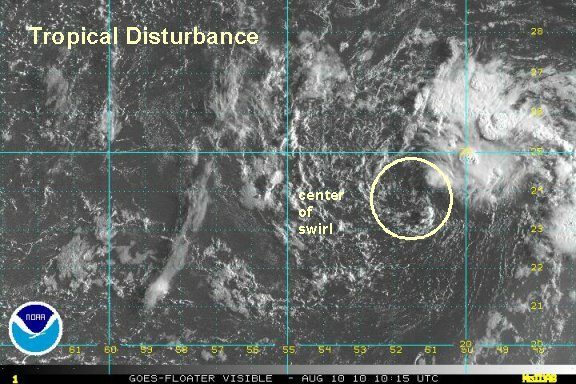 It also has a burst of convection on the northeast side of the swirl. We agree with the hurricane center that the disturbance is still probably too weak to be classified as a low center (tropical depression). 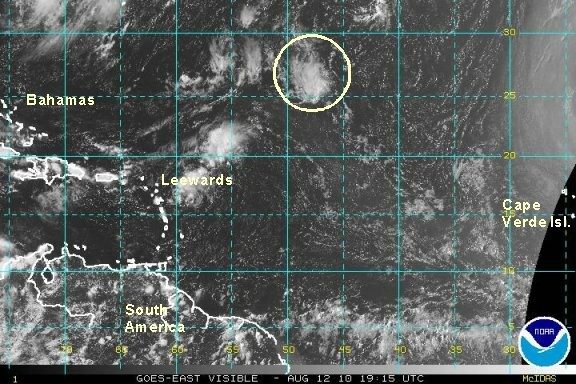 A tropical disturbance about 1000 miles east northeast of the Leeward islands still looks like an expansive low level swirl of clouds instead of a closed low. Deep convection is expanding on the northern part of the circulation. 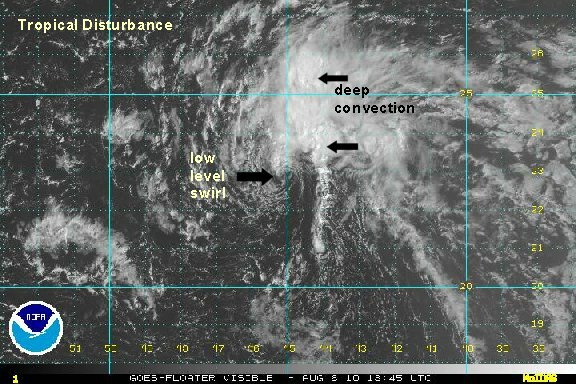 Development of a tropical depression depends on the low becoming better defined and convection expanding. The circulation is becoming more diffuse than earlier today. There is less convection too. A tropical disturbance a little over 800 miles northeast of the Leewards continues nearly unchanged. Deep convection is holding onto the northeast side of the circulation. The low level circulation still resembles a low level swirl of clouds instead of a closed low. Conditions may become a little more favorable for development over the next day or two. This tropical disturbance is not a threat as it moves into the open central Atlantic over the next several days. No new changes since this mornings update. It appears that this low is not going to get its act together. The low level center still looks diffuse. A small area of convection is on the east side of the weak low level center this morning. 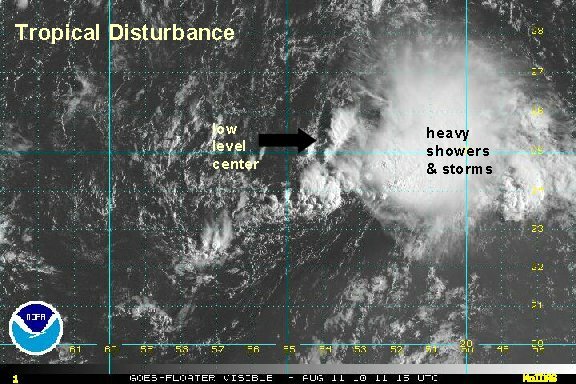 If it can hold onto this convection NHC may classify this as the next tropical depression. There is still a growing burst of heavy showers and storms farther to the east well away from the center. This tropical disturbance is not a threat as it moves into the open central Atlantic over the next several days, well east of Bermuda. The low pressure center that we have been following has collapsed. Just before writing this tropical disturbance off, satellite imagery showed a new, well formed ciruclation that was hidden in the deep convection well to the east. 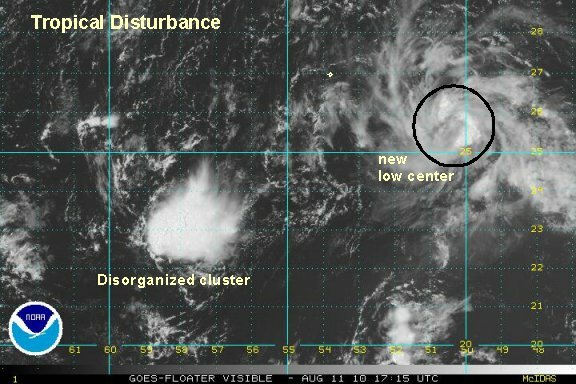 So, it looks like a new tropical depression has formed under the deep convection burst. The unofficial tropical depression was centered near 25.8 N / 50.3 W or a little less than 1000 miles northeast of the Leeward islands. It was moving north at about 10 mph. Top sustained winds 30 mph. 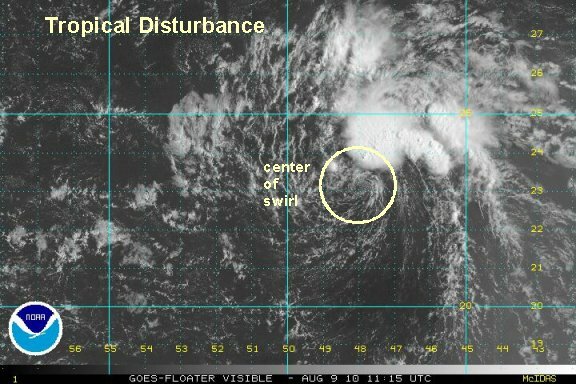 It looks like a tropical depression is still in the middle of the Atlantic. It is interesting to note that the hurricane center dropped satellite coverage. It is still apparent that a low level circulation is visible with deep convection near the low. I assume that since it is no where near land and is heading north into the vast open waters that NHC is not bothering with it.